Starting and sustaining a reliability program is important, but proving the business case and justifying it over the time to see results is a challenge. This guide will help you establish a condition-based maintenance (CBM) plan to support your reliability program, with a primary objective of preventative maintenance optimization. 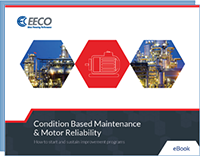 Download the eBook by filling out the form to learn more about CBM & Motor Reliability and how your company can benefit. For questions, contact our motor team at 800.993.3326 or eecomotorteam@eeco-net.com.